GETTING A MONOPOLY GRIP ON THE BOX TRADE — WILL THE KREMLIN, OR VLADIMIR LISIN, ALLOW MAERSK TO TAKE OVER RUSSIA’S CONTAINER BUSINESS? The takeover announced at the start of this month by Global Ports Investments (GPI) of the National Container Company (NCC) gives control of more than 72% of container transportation volume in Russia’s west, including the Black and Baltic Seas; and more than 82% of Russian box volume in the northwest, from the Gulf of Finland to the Arctic. Calculations by Moscow maritime expert Alexei Bezborodov indicate that with accumulated capacity of 1.7 to 1.8 million Teu per annum, Global Ports is taking “a monopoly position in the market”. Teu stands for twenty-foot equivalent unit, a measure of container length and of cargo capacity roughly equal to 22.6 tonnes. As of August 31, the volume of the total Russian market stands at 3.5 million Teu. In the Russian Fareast, volume is currently 1 million Teu. The takeover deal must be approved by the competition authorities in Russia, Ukraine and Cyprus. In addition, because a foreign shareholder holds more than 25% of Global Ports – that’s the APM Terminals company of the Maersk group of Denmark – the takeover must be approved by Russia’s Control Commission. This is the ministerial body, chaired by the Prime Minister, which regulates foreign involvement in strategic resources of the Russian economy. The Federal Antimonopoly Service (FAS), headed by Igor Artemyev, is the regulator in charge of the competition review. It is also the staffing agency for the Control Commission. Artemyev has a record of putting his finger up to test which way the Kremlin wind is blowing on such deals. For the time being his finger is invisible; he is saying nothing. A spokesman for FAS confirms that both reviews are under way. “All this should take about a month, “ the spokesman said, “but it can be extended.” Extensions are what happen when a deal runs into head and cross winds. In this case, the biggest of these is likely to blow from Vladimir Lisin, who owns the Universal Cargo Logistics Holding (UCLH), a direct competitor for Global Ports and NCC. Lisin’s foreign partner and competitor for Maersk is the Mediterranean Shipping Company and its Terminal Investment Limited (TIL) unit. The Russian shareholders of Global Ports are Nikita Mishin, Andrei Filatov, and Konstantin Nikolaev. For their story, with hints of who their silent partners are, read the backfile. A tussle between the troika and Lisin would involve the senior government ministers, and in the end President Vladimir Putin. 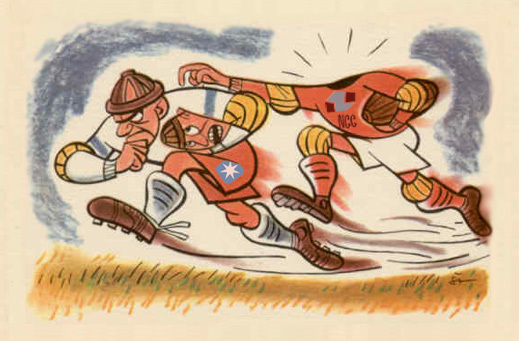 In his St. Petersburg past, he has had a soft spot for Maersk, from before the banana boat run into St. Petersburg, and many years before Vladimir Kekhman was disposed of. The timing of the proposed monopolization of the container business is at least as problematic as the foreign participation. That’s because the boom in container movement into and out of Russia has been sharply curtailed by the global economic recession of the past year. Global Ports ended 2012 with revenues of $501.8 million; this was static compared to 2011. Costs jumped 24% to $343.2 million. The impact was that operating profit contracted by 30% to $157.3 million. Earnings gained 2% to $287.9 million, but after-tax profit plunged 16% to $123.5 million. Global Ports’ container operations in Russia contribute almost three-quarters of revenue; they grew by 8% for the year. The operations included Petrolesport (PLP) and Moby Dik container terminals at St. Petersburg, VSC at Vostochny; altogether, containerised cargo grew by 8% over the year to 1.45 million Teu. Cargo volumes also picked up at these locations for bulk cargo, cars and roll-on, roll-off movements. By contrast, the group’s Vopak oil products terminal at Tallinn, Estonia, suffered a 35% drop in cargo tonnage to 10.4 million tonnes. Lisin owns the Fourth Stevedoring Company in St. Petersburg, also known as Container Terminal St. Petersburg; plus port companies at Tuapse (Black Sea) and Taganrog (Azov Sea), and a terminal at Ust-Luga called Multipurpose Reloading Complex. Together, they are reported to have had cargo turnover in 2012 of 32.6 million tonnes, with revenue of $350 million and earnings of $170 million. According to industry reports, the ports may be worth between $1.2 and $1.4 billion. Aver denies the valuation. What is certain is that whatever the assets appeared to be worth a year or two ago, they aren’t likely to enjoy significant gains in share price or market capitalization, if floated on the London Stock Exchange. If as UCLH acknowledges now, the plan is to find specialized regional buyers, buying interest is probably limited to specialists in grain transportation and containers. 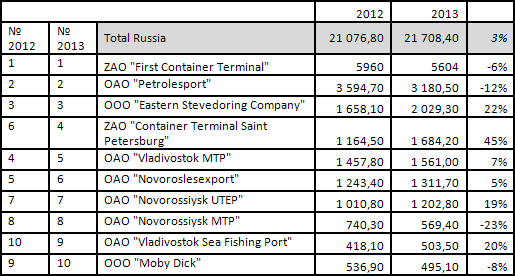 This is a tabulation of the top-10 container companies operating at Russian ports as of June 30. The data have been prepared and analysed by the industry expert, Moscow-based Alexei Bezborodov, editor in chief of Infranews.ru. Bezborodov is also predicting the emergence of APM (Maersk) as the dominant shareholder in the new combination of Global Ports and NCC as the Russian stakeholders are short of cash. Releases by the dealmakers indicate that after the NCC shareholders receive 18% in the expanded Global Ports company, APM will have 30.75%; the troika of Global Ports founders (Mishin, Filatov, Nikolaev) , 30.75%; with a 20.5% free float of London and Moscow shareholders. The announced deal terms provide the NCC sellers with $291 million in cash, and they will be able to start selling their 18% — now worth $310 million — after a six-month lockup, with APM in pole position to buy. Counting NCC’s $916 million in debt which Global Ports is taking on, the deal is costing $1.6 billion. The Ukrainian container terminal at Ilyichevsk can be sold separately over the next three years. Russian sources see the alliance between APM and the three Russian control stakeholders in Global Ports as an emerging “national container champion” to threaten the container business of Ziyavudin Magomedov at Novorossiysk port. A report by Irina Stupachenko and Denis Ashurkov at Otkritie Capital in Moscow warns that NCC is exiting the Russian container business when growth and profit prospects are dwindling. They claim Global Ports is paying too high a price for the takeover, and will potentially suffer from the heavy extra debt it is taking on at a time when its container volume is contracting compared to a year ago. According to Stupachenko, the concentration of the market may not be desirable for UCLH and other container operators, but she is predicting that the FAS will approve the deal, adding conditions to prevent tariff discrimination among customers.